Heaven's Prey is a novel of suspense and redemption, so let's have some fun with a "blog chase." Follow the trail between Oct. 31 and Nov. 7, 2013 for a chance to win a print copy of Heaven's Prey. You're at the first stop in the chase. Welcome! At the end of this post you'll find a link to the next stop. You'll need to visit each stop so you'll know the answers for the quiz at the end ... that's how you enter the prize draw. A chill wind moaned around the corner of Ruth and Tony Warner's suburban bungalow, etching frost ferns on the window. In the kitchen, Ruth stirred chocolate sauce at the stove. Bubbles multiplied, tumbling over one another until the whole mass seethed up the sides of the pan. Like Ruth's fears for her missing niece—they'd grown until she thought they'd swallow her whole. She cut back the heat and kept stirring. Susan had been gone for a month now, with no clue, no contact. Could Ruth trust this new hope that lit her spirit? She glanced at her husband's broad back as he washed the cherries and strawberries. His shoulders drooped these days. "Tony, I have something to tell you, and I don't want you to laugh." "You're going to get a rosebud tattoo. Somewhere personal." His sandy eyebrows wiggled. Ruth flipped a pot holder at him. "No, I mean it." Tony leaned against the counter. The overhead light showed lines that hadn't creased his face a month ago. New strands of grey glistened in his beard. Ruth pushed the fringe of hair off her forehead. "I had this dream last night. About Susan." His smile fled. "Why didn't you wake me?" "No, it was a good dream. I saw her—Susan—in a beautiful garden. In a long, white gown. She looked so happy. Maybe—maybe it's God saying she's okay." The lines deepened around Tony's eyes. "It's time to face reality. She's not coming back. When a young woman disappears, especially in a big city like Toronto ..." He clamped his lips together. This is a glimpse of Ruth and Tony's lives before the novel opens. I hope you'll follow along and learn a bit more. Since Ruth and Tony live in Nova Scotia, on Canada's east coast, each of our blog chase posts will include a piece of Nova Scotia trivia. Did you know? Nova Scotia is the Latin name for "New Scotland." 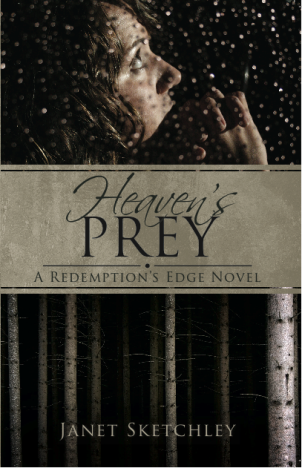 Heaven's Prey releases November 1, 2013. Visit Choose NOW Publishing to read a sample chapter ... just don't forget to come back to the chase! Preorder links are on the Choose NOW site as well. I hope so, Dale! It seemed like fun to me -- all credit to the amazing Valerie Comer for suggesting it. As a Canadian writer, I'm glad to start the blog chase here at International Christian Fiction Writers. Thanks for having me! Started the chase here. It will be wonderful to find other Christian writers. Thanks for joining the chase, Janis! Hope you enjoy and share it out to your friends and followers. This is a fun site, Janis. I love how the Internet lets us connect with writers all around the world. I worried about sleeping at night while reading it! But well written, for sure. Angela and Valerie, it's a better-crafted story because of you both. Thanks so much! Congrats on the book release, Janet! This sounds like a fascinating story. Can't wait to read it. Thanks, Stacy! It was a tense one to write, but I'm pleased with how everything turned out. Janet, congrats on your book release :) The blog chase is a fun concept - thanks for including us in your chase. Thanks, Narelle! I'm glad to be here! Congratulations, Janet, not only on the book, but on the blog chase too. Fun to do--plus I learnt some things about Nova Scotia as well! I'm impressed by the blog chase, and the bits of trivia on Nova Scotia add a little spice. Interesting story...I want to know more! Thanks, Sara. I figure most people don't know much about such a small place as Nova Scotia, so I can take advantage of that. Did you do the quiz for a chance at winning a copy? It's at the final stop. Free = the best way to read! Thanks, Bonnie. I'll have your review copy in the mail shortly -- haven't received my copies yet.